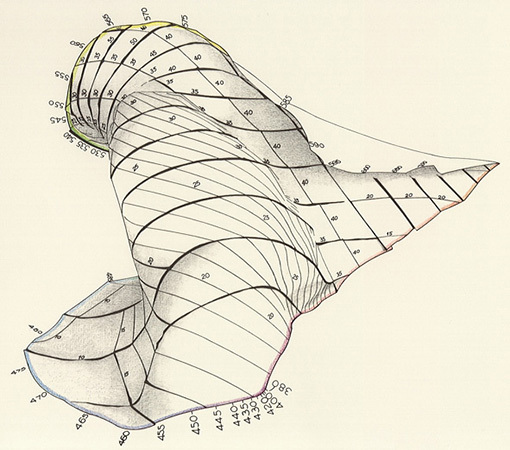 Optimal colours are theoretical constructions defined by physical concepts. A transparent body can be said to possess an optimal colour if, at a predetermined wavelength, it either permits all light to pass through it (transmission) or blocks all light. An opaque body of optimal colour either reflects all light of a certain wavelength (remission), or it absorbs it completely. Of course, there are neither pigments nor dyes which imitate these properties perfectly, but optimal colours can nevertheless be counted amongst all conceivable non-self-luminous colours. Our plate concerns these colours — and not self-illuminated objects. As can be seen, all realisable non-self-luminous colours lie within the colour-solid first described in 1928 by the German mineralogist S. Rösch, the surface of which is taken up by the optimal colours. 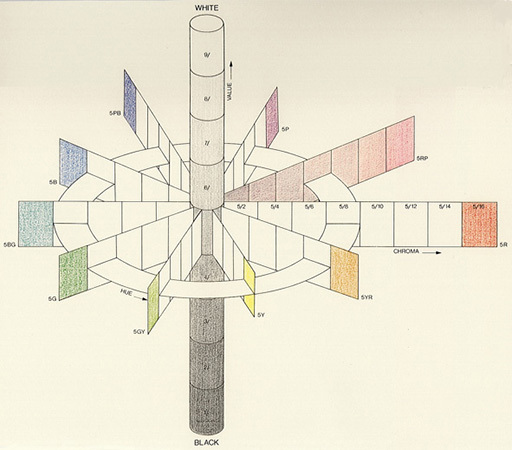 As implied by the title of his work, Rösch wanted to facilitate the Classification of Colours. As far as additive colour mixing and its measurement is concerned, the term «colour valency» is often used by experts in preference to the word «colour» alone. A colour valency is specified by the three digits which form the basis of the CIE system. These digits determine the value of a colour stimulus for an additive colour mixture. We can thus state coolly and correctly that, with colour-valencies pertaining in each case to the same colour pigment or material, the optimal colours are the brightest and, with colour valencies of in each case the same brightness, the optimal colours are the most saturated. The degree of brightness of a colour is described as the so-called relative brightness value, seen in comparison to a pure white. 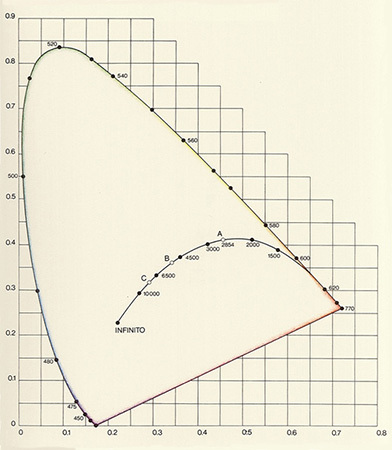 Special diagrams permit the brightness of the optimal colours to be ascertained for any given pigment or material. If this parameter is integrated as a third dimension into the CIE diagram, the Rösch colour-mountain will be created, rising above the point C — the symbol for the standard light source. The planes, which become smaller and brighter towards the tip, each contain colours at equal brightness, and in the diagram represent the values 0 (the original CIE diagram), 20, 40, 60 and 80. With 100, the mountain reaches ideal white, and thus its summit. If we were to use the CIE diagram with colours which are created by scattered, refracted or reflected light, not all regions within the tongue shaped surface (as defined by the spectral curve and the purple line) can be occupied. Rather, there will be a restricted area for these non-self-luminous colours, and this area is dependent on luminance. This factor caters for the selective change which a body imparts on light rays and, with this factor as a reference, the area available within the CIE diagram can also be calculated. Following Rösch’s lead, the American psychophysicist D. L. MacAdam became the first to define this area exactly, and for this reason experts nowadays refer to «MacAdam limits». The chart shows these limits as they occur at a luminance factor of 0.3. 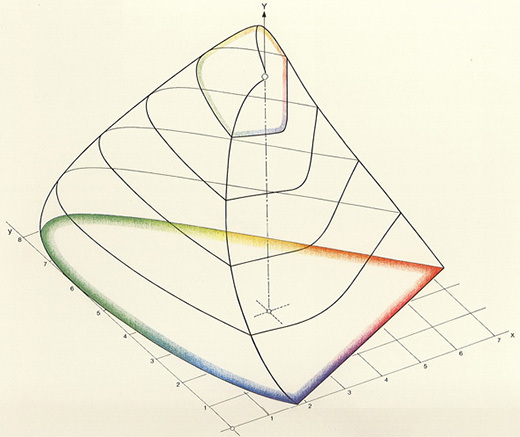 The positions of 22 non-self-luminous colours have been plotted in this diagram, which can partly be derived from standard tables based on Munsell’s system. The three green hues which appear in the upper area possess, from left to right, the values 5G 6/10, 10GY 6/12 and 5GY 6/10, according to Munsell’s notation (hue, value and chroma). In our everyday language, we would perhaps refer to these as brilliant green, light yellow-green and deep yellow-green. In Munsell’s notation, no further full-digit values can be given to the three colour-hues assigned to the lower right, at the end opposite green. But we can still give them names — from left to right we could call them dark pink, deep red-orange and brilliant orange. 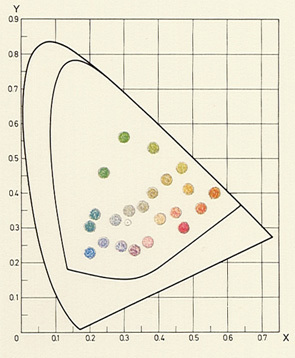 Date: The mountain-like identification of colours was introduced in 1928 by the German physicist S. Rösch. Bibliography: S. Rösch, «Die Kennzeichnung der Farben», Physikalische Zeitschrift 29, pp. 83-91 (1928); G. A. Agoston, «Color Theory and Its Application in Art and Design», Heidelberg 1979; M. Richter, «Einführung in die Farbmetrik», Berlin 1976.